Hi Folks, I'm after some clarification if possible. At work there are 4 protected Fire Escapes - all of which have Fire Doors and smoke seals on them. The escapes themselves are of brick and block construction and the stairs are preformed concrete, under all four staircases on the ground floor these is a store room or service room. Again these are all fitted with Fire Doors. All the rooms have Fire Detection in them and most have a sprinkler head in there as well. The problem / question..... One of these under stair store rooms has now had a larger store room built on the outside of the store so effectively a room within a room, this new room is not fire rated as it's just basic gyproc walling and ceiling tile. ow the contractor has removed the Fire Door from the original under stair store room and has place the door on the new store room opening. I have questioned this with them as I believe they have now breached the Fire Compartment that was under the stairs because they have removed the Fire Door. 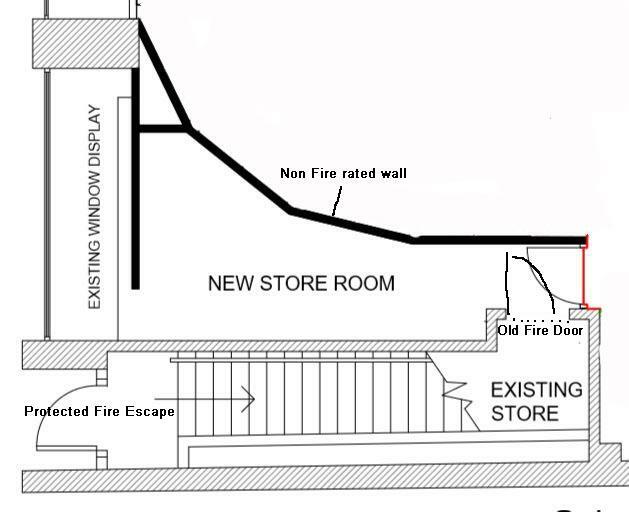 Am I right in thinking that even with this new room the area under the stairs still needs a Fire Door to protect the escape stairs, and that because there is now a room within a room the new store area also need to be made into a fire compartment by means of Fire Boarding and a full new Fire Door and frame on the new door entry. The stairs and I assume the landing are concrete construction, the enclosure is brick or block, so the escape route is separated from the storeroom by at least 60 mins FR so cannot see any problems. However moving the old fire door to its new location serves no purpose because the new and old storerooms are not fire resistant (FR) because of the non fire rated wall and removing the fire door. In my opinion because storerooms, in most situation, are a high fire risk and should be enclosed to a minimum 30 mins FR. The wall you claim is non FR could be if the studding and ceiling meets a 30 mins FR standard which it can be using plaster board.